Many exotic pets need supplemental heat to thrive in captivity, but there are some animals that do well in, and sometimes even prefer, cold climates. If you live in an area that experiences winter and are worried about your pets' safety, then these might be good options to consider. These are just some of the exotic pets that do well if it gets chilly. These special foxes are native to colder environments and can only be purchased from Russia where they thrive in the naturally cold climate. Foxes are built for this type of weather with their bushy tails and thick fur coat. No special coats or boots are needed for these pets. A cross between domesticated dogs and wolves, wolfdogs have thick fur coats and are built for colder weather. This doesn't mean they should be housed outdoors year round, but you won't need to worry about this dog shivering like a chihuahua. Wolfdogs require a special level of care and are not for everyone. Native to the Andes mountains, chinchillas experience temperatures that range from almost freezing to into the 80s. These rodents definitely do better if their environments are on the cooler side rather than the warmer side. They even sell granite slabs for chinchillas to help them stay cool if your house gets too warm in the summer. Everyone who has ever touched a chinchilla knows how soft they are. They have about 60 hairs that come out of each follicle making their fur super soft. These hairs also keep them warm. The North American opossum is used to large variations in weather and very cold winters. Opossum fur is unique because it doesn't freeze. The only other animal that has fur that doesn't freeze is the polar bear. The opossum and polar bear have fur that has hollow shafts that hold warmth in and keeps them very warm. 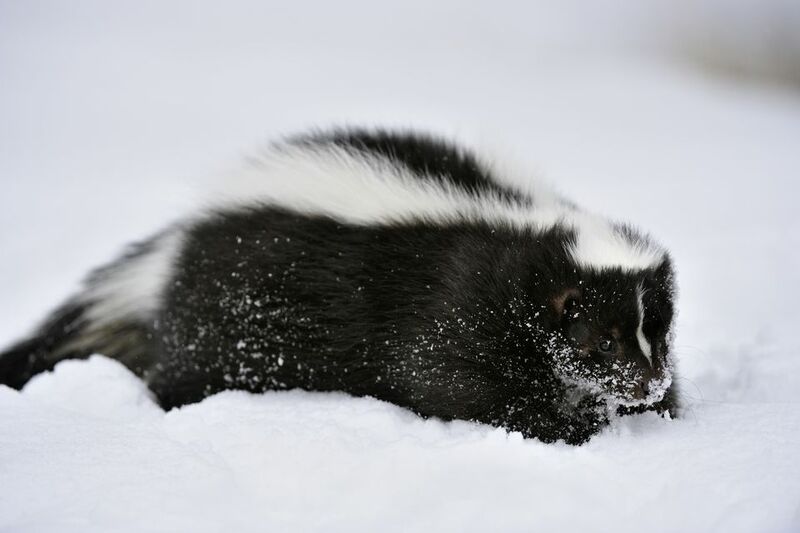 Just like opossum, skunks don't hibernate but rather hide out in burrows and forage for food in the winter just like they do in the summer. They don't explore in frigid temperatures and will wait until the weather is a little milder, but they definitely don't mind the cold. They have thick fur coats to protect them. Another North American native, raccoons make their homes in trees but spend all seasons of the year exploring. They don't hibernate and continue foraging for food even when there is snow on the ground. Their plush coats and tails keep them warm year round. Their fur is dense and their guard hairs are rough to protect them from inclement weather.